Spoken to the tune of “Wear Sunscreen”. If I could give you a single piece of advice. This would be it: Be wealthy. The long term effect of accumulating wealth has been shown to lead to a richer and more interesting life whereas the rest of my advice is only based on my personal experiences. Rent a room. If you rent an apartment, get a room mate. Turn down the thermostat. Wear layered clothes. Live close to where you work. This way you don’t need money and time to maintain a car. Walk unless you live more than two miles away. If you live more than two miles away, get a used bicycle and learn how to maintain it. You can go faster on a bike than a driver stuck during rush hour. Smile as you pass them. Never take the bus or a taxi if you can walk. Soon you will not understand why walking five miles or riding ten miles on a bicycle is considered an accomplishment by your sedentary friends. Learn to cook. Eat simple healthy meals and know your recipes by heart. Abandon shopping lists and arrange your meal plan around sales and loss leaders. When a store has a loss leader sale, you know which recipe it fits. Always buy store brand. This way there’s no need to clip coupons. Don’t drink milk and cut down on the meat. Eat more vegetables, fruit and beans. Eat oatmeal instead of sugary cereals. Eat to live. Don’t live to eat. Don’t join a gym but exercise daily. Get a barbell or a kettlebell and learn the olympic lifts. After a while your friends will think you are “freakishly strong” and wonder what your secret is. Shop at thrift stores. Learn about the difference between price and value. Dress better than other people even though you only have three outfits. Don’t watch TV. TV is a waste of time. Whenever you think of buying something put it on a waiting list. Check your list every month. Often you will find that you don’t “need” it anyway, but if you still want it after a month, buy it. Share your things and help others. When borrowing things from others return them in as good a or better condition. If you need something simple, learn to make your own from scratch. Learn how people used to solve this problem before they headed down to the Mall. If something breaks, repair it instead of replacing it. Always consider whether a purchase adds to your assets or liabilities. Learn about investing. Start thinking like a wealthy person instead of a consumer. Don’t pay other people interest, let them pay you interest. Never worry about having money or paying bills. Feel free to use credit cards knowing that you can pay it off in full every month. Wait around for the best deals. You have the upper hand now. Feel free to quit your job if you don’t like it knowing that you will not run out of money for at least a decade or maybe even the rest of your life. And never be ashamed to pick up free money from the street. 19 users responded in " Wear a wide brimmed hat and retire extremely early "
You are my idol. That is the truth, when I grow up, I hope to be like you. I don’t know about this thermostat business though. I like to put the heat on full blast because my childhood was very deprived and my parents wouldn’t put the heat on high enough even though it was literally freezing outside. Gobs and gobs of hot air blowing from the furnace is my guilty splurge in life. Or at least a bucket full of hot coals. I love this post because since deciding to stop being stupid and get out of debt two years ago, this ideal you write about here has been what I’ve worked so hard to become. It’s a way of life, and you say it so well. I’m not there yet, but I’m only 22 – and with a high-paying job and no-debt on the horizon (I was such an idiot at 18), I think I could get there! Even if it takes me until I’m 40 to get it right. Yeah, but there is also the fact that life ends with no previous advise, so, the key is to find whatever makes you happy….AND DOING IT, not worring or wondering what others will say or think about, but just enjoying the life itself, why spending the life dreamming about how our “sacrifice” will let us archive our goals eventually? if your know what you want, if that is clear there shouldn’t be nothing more but that, without fears or doubts beacuase we can see the path we’re walking, and the path it self will be the price. Well thats my point of view, it have worked for me; obviously I have had hard times like everybody else, but when you are making your dreams true instead of dreaming, those hard times are also part of the dream; Find what makes you happy and the way to join that on your working life as it is already present on your personal life, because the true is that at the end, working YOU a personal YOU were just YOU, what makes YOU HAPPY works for both sides. Well, like I said it’s my oppinion, works for me, and I understand that everyone is different and what works for me not necessarily works for others…and viceversa, but hope works for someone else. Following this advice will result in suboptimal health and shorten your life. Better to eat lots of free-range chicken, eggs, fish, grass-fed meat, & green leafy veggies, and eliminate all gluten grains from your diet. Yes, oatmeal is not as bad for you as sugary cereals, but that does not make it healthy. Most of what passes for research in nutrition would not earn a passing grade in a rigorous college-level science course. There are *no* studies comparing oatmeal to a grain-free diet, and there probably won’t be as long as the USDA or the Quaker company dominates the funding of nutritional ‘research’. Yet another way to shorten your life and *increase* your risk of cancer (including skin cancer). For optimum health, you should get your optimum dose of vitamin D via exposure of 60% of your body to noonday sun for 10-15 minutes per day (less to start out, more if you live far from the equator). Failing that, take vitamin D supplements. I’m taking the no-taxi thing to heart now. This weekend, I had my first taxi ride in SoCal. Um, $16 to go less than 4 miles. WTF?!?! Never again! I will brave the bus drunk, if I must! These articles are awesome, though I have to agree with Frugal Bachelor on the thermostat thing. What is the point of having lots of money so I can be financially free if I’m not even comfortable in my own house. I save by turning it down when I’m not home, but I want to be comfortable when I’m there. @Derek – You can get used to a temperature which people normally consider too cold. Once that happens, normal temperature will seem pleasant or even too warm. Following this advice will result in suboptimal health and shorten your life. Better to eat a variety of colors of vegetables and plenty of fruits and eliminate all meat and dairy from your diet. Yes, meat and dairy are not as bad for you as sugary cereals, but that does not make them healthy. Most of what passes for research in nutrition would not earn a passing grade in a rigorous college-level science course. There are *no* studies comparing dairy to a dairy-free diet or meat to a meet-free diet, and there probably won’t be as long as the USDA or the meat packing companies dominates the funding of nutritional ‘research’. Look I can make the facts say what I want as well! @Derek – I can vouch for Jacob’s point. Right now on a wintry evening in Scotland I am sitting at home feeling lovely and warm with my thermostat turned to 18 celsius (64.4 in fahrenheit). During the day if I’m at home I have it at 17 (62.6 of your degrees). Basically your body adjusts to whatever you ‘normalise’ it to, so you can train it to only feel comfortable with very high temperatures like 68, or you can train it to feel comfortable with lower temperatures. Personally I wouldn’t be able to sit for long in a room that was as hot as 68 – I’d have to open windows to cool it down. Yes, AJ, TXCHLInstructor has likely no strong evidence to back his position, either. The point is: nutrition, as a science, is a mess. I believe it will get better as time goes by, but it will be a while before we have very good *mechanistic* accounts of various foods on our health. Plus, we may find that certain genotypes require different nutritional profiles; that is, some people do better on different diets. What is indisputable, though, is I LOVE OATMEAL. these are very sensible advices. 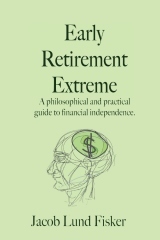 you are certainly a pioneer when it comes to extreme early retirement. So many good advices here! I’ve always had a waiting list before buying things. I do have few clothes that are nice. I’ve never bought in thrift store though. As to not joining a gym? I’m a bodybuilder so that’s a must. I might consider making my own gym in my house. i just emailed this to myself as although i can go easily 20 yrs without a job on my current level of spending, i still think like an employee that coudlnt make it a month without a paycheck. There you have it, everything you need to know. + Don’t speculate in stocks. Invest! I greatly enjoy your website. It’s very refreshing to find others similar to myself concerning personal finance and consumerism. You’re an excellent writer and I look forward to your future posts! So true about thermostat settings. Only problem I run into is keeping guests comfortable- I had to raise it to 66 for Thanksgiving and still got complaints about being too cold. So visiting friends and family really tax the propane bill. As for food though; I think food is one of the delights of life. I love trying different foods and eating well. So for me, denying myself that to be frugal would feel like deprivation. I don’t eat out much but if I do I want to really enjoy good food. I don’t eat meat though, and my food budget is pretty cheap by most American standards though even though I eat quality food. I could spend less if I had to but I’d rather not. I also am careful with buying “stuff”. I did just order a Kindle as they marked it down to $49; figure I can borrow all sorts of books for free for it, others really cheaply. And it will be great to travel with. But I’ve been thinking about it for awhile and watching the price. I use the library a lot- borrow most books. But some I can’t find that way and this will make those available. I would still have a shopping list even if I am buying stuff on sale. I usually forget what I have to buy so a list is always handy.